Since the month of April has started and many of you know that it's my birthday month so i have planned some awesome giveaways throughout the month till my birthday (April 29th, teehee)..
And what could be better than the stuff that i love the most.. 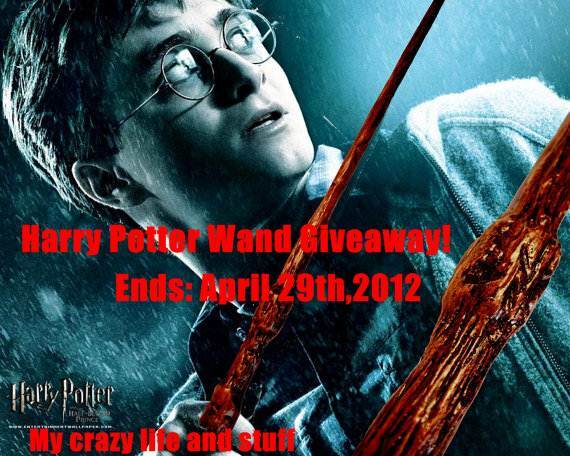 I have already done two giveaways involving Hello Kitty and Glitter, now it's Harry Potter's turn.. So I happened to go through this Etsy shop called Kiklopsdynamic..
and in this giveaway one of the followers will get this Harry Potter Wand.. If I had to choose a character, I'd probably be Luna. It must be really fascinating to see the world through her eyes.. I think I would want to be Albus! Hermione of course! love her!! I would be love to be Hermione but only because she's so smart. I would be Dumbledore, for sure. To have his wisdom and knowledge, and his wicked moves. I absolutely love his character. How protective he is over Harry. If I had to choose a character, I'd probably be Hermione. Thank you for the giveaway! I'd be Hermione - she is smart. Oh and I would love to be Hermione. I'm a total nerd like her and I love her loyalty, her bravery and shrewdness! If I were a character of Harry Potter I would like to be Tonks! :) You are welcome! good luck! Hermione, for sure! :D She's the best! Hello! I sent you one FB friend request with my personal Facebook username: Alda Lopes Moreira. The other entries were made with my blog facebook name: Framboesa. Thank You ! I would be Hermione- smarty pants! I think I would be Luna. She's just happy who she is and that's awesome. Plus, she's quirky and so am I.
I'll be Hermione. She's definetly like me.